Here at UK TV Repair we specialise in TV repairs Birmingham. When your television turns faulty what do you do? The obvious option is to purchase a new one but what if I told you that you could save hundreds of pounds when getting a television repair? First things first if you have a screen fault like a cracked screen or horizontal lines running down the front then our company will not repair this. This is due to the fact of purchasing a new television costs roughly the same amount of purchasing a new screen. If you have any other issues regarding your television like sound issues or your television isn’t turning on at all then our TV repairs Birmingham will be of use to you. We completely understand what a pain it is when your television packs up. 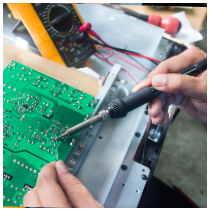 You can trust our team of experienced television repair engineers to fix your problem. Prices vary dependent on which model of television you have and what problem is persisting, however when you disclose your issue we will give you a fixed quote. The price you are quoted is the price you pay and that is our promise. How UK TV Repair work is once you make the phone call and a appointment is a arranged we will come to your home address and attempt to fix your television on site. As some repairs are more difficult to carry out and will need certain tools your television may have to be taken back to our workshop. We offer a free no obligation estimate for the repair cost of your TV. You can ensure that our quotes are highly competitive and you won’t beat our price. If you have a cheaper quote from a different company we will beat it. 100% satisfaction guaranteed.